Looking for a new appetizer for your next party or game night? 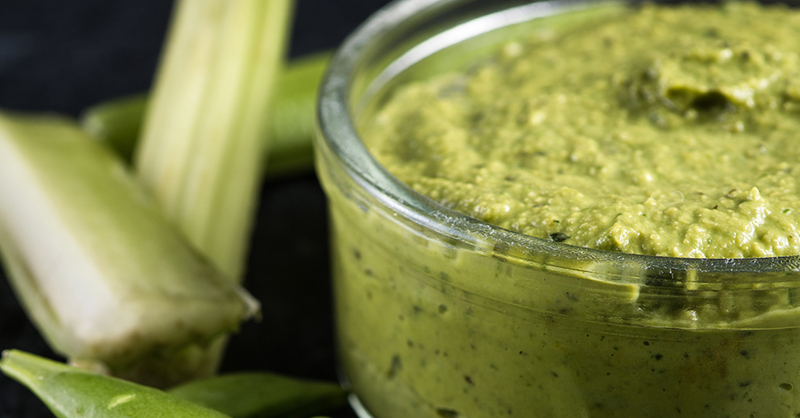 This cucumber mint pea dip is a great way to switch up your typical hummus and pita chips. Perfect for entertaining, this dip is light, refreshing and healthy. This recipe uses a few simple ingredients (that you likely have on hand) and is whipped up in minutes using a food processor. You can spend more time talking to your guests and socializing and less time in the kitchen! Packed with fiber, iron, and vitamin C, this is one party dip you can feel good about eating. Combine cooked peas, mint, garlic and lemon zest in a food processor and pulse until combined. Drizzle in olive oil, tahini and lemon juice, and pulse until smooth. Transfer dip to a serving bowl and drizzle with more olive oil. Serve with cucumber sticks and celery. Enjoy!